Region: This insect pest is found throughout the avocado growing regions of California. Its native region is Mexico to Guatemala. When this insect was discovered in 1996, causing havoc on California Avocado orchard in Ventura County, California, it was species new to science. Life cycle: The Avocado-Thrip lays eggs, singly into the soft tissue of leaves. These thrips produce numerous generations each year. A new generation emerges every two to three weeks. When the eggs hatch, they undergo two larvae stages that actively feed on plant tissue. Thrip larvae are often found on the underside of leaves. During the pupae stage, they will drop below the host plant into the soil and leaf litter. As adults (after pupation), the adult thrips migrate back into the host tree to continue feeding and reproduction. 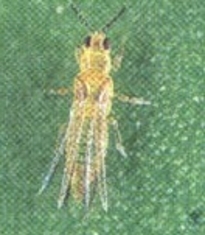 Physical Description: Male thrips are smaller than the female, and unlike many thrip species, the males are found throughout the general population. The adults are light yellow, and have thin dark lines running across the upper area of the abdomen. Their wings are brown. Larvae are light yellow in color. Feeding characteristics: This pest is only known to attack avocados. This pest damages foliage and is found on upper and lower leaf surfaces. The leaf damage is a bronze colored between the leaf veins. The adult and larvae Thrips feed on developing fruit. Once the fruit is past the size of a golf ball, it is less susceptible to damage. Feeding scars develop on the fruit, resulting in an "alligator skin" like appearance. Controls: It has been found that high temperatures, 86°F (30°C) and low humidity (<50%) significantly reduce this insect pest populations. Avocado orchards have natural subtropical biodiversity. This biodiversity encourages many natural predators that will help to control thrip populations.